in breeding and dog sports for 30+ years. Our introduction to Poodles began at a young age. a menagerie of furry companions. along a fast moving trout stream, the "Little Manistee"
that winds through some of Michigan's beautiful National forests. and reaching the preferred standard to be the most important. but we guarantee that the dogs we do breed have been health tested themselves. to introduce them into our breeding program. Our poodle moms have on the average 3 litters in their lifetime, if even that. in following the latest trends.... so you will not find any "designer"
or "doodles" being offered on this site. It makes no sense to charge families large sums of money for a mixed breed? If that is what you prefer, then by all means, please help those in a shelter needing a home. 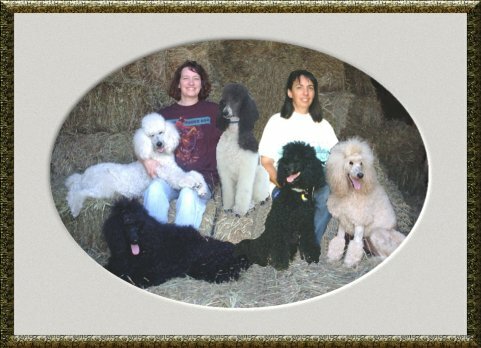 We raise PUREBRED, AKC registered Standard Poodles ONLY!! and Canada to be able to participate in their events. 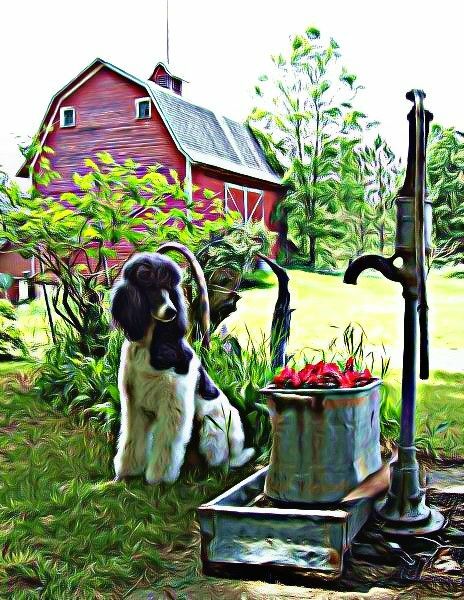 We do not in-breed and our poodles have very low COI which means low in-breeding. from UC Davis Laboratories in California to breed even more diversely for "better health". for the family as well as obedience, therapy, and hunting dogs. initial contact via our puppy questionnaire.